Do you or anyone you know love the Groot from Guardians of the Galaxy movie? Groot is basically the Giving Tree on steroids. They are kind, big-hearted and able to make plants and flowers grow from his body. 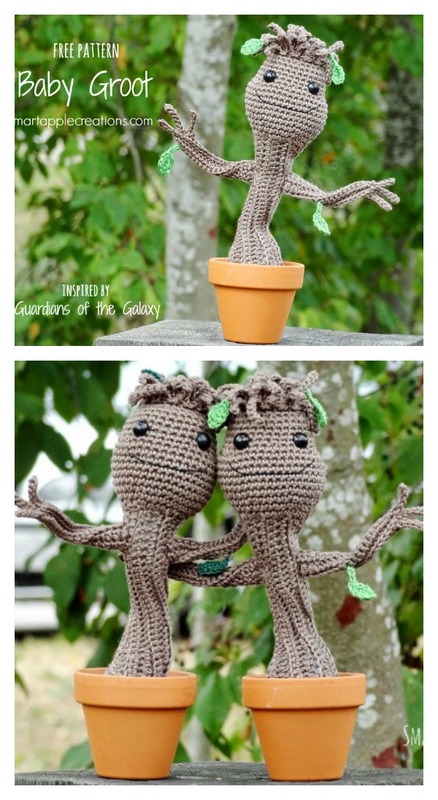 The Crochet Potted Baby Groot Free Patterns are just for you to crochet amazing homemade dancing baby Groot. The patterns have detailed step by step instructions. In addition to worsted weight yarn and embroidery thread, you’ll also need pipe cleaners, safety eyes, stuffing, and of course, a small pot to complete this crocheted Groot. Put on your Awesome Mix Vol. 1, grab your crochet hook, and crochet yourself your very own baby Groot. You will win the hearts of children and adults with this cute yet quite simple crocheting project. Enjoy.